Here is the list of Best Free Grib File Viewer for Windows. Grib files contain rich weather prediction data from all around the world, and these Grib viewer software can open Grib files pretty easily. Viewing Grib data is very important for sailors from all across the world, as it helps predicting wind, temperature, tide, cloud, and stream trend. Not only these freeware let you open saved Grib files, you can actually use these to download Grib files from their servers. As these software provide worldwide Grib data, you can download files according to the region you select. You can further narrow down data download by selecting the trend info that you actually want. Apart from Grib data, these Grib viewers can also be used to load and view various other weather related files and info, which includes satellite images, cloud map, temperature map, rain map, stream map, buoy data, etc. The data that these software to view Grib file provide are very accurate, as its is provided by various meteorological departments, such as NOAA, Meteoblue, FNMOC, CEP, ECMWF, etc. Go ahead and read out more about these Grib viewer software to select what suits your need. You will also get to know, how to view Grib files and how to download Grib files with the listed software. If I had to choose a Grib Viewer to view existing Grib files, I would download any of these software, as all of them let you view Grib files with same functionalities. If I had to choose one based on the downloadable weather info they provide, I would go with zyGrib, as it provides an extensive set of weather information. You can also checkout the list of best free Unit Converter Software, Business Card Maker Software, and EPS Viewer Software. zyGrib is a free Grib file viewer, with an exhaustive list of weather data visualization tools. It lets you download and view comprehensive weather detail from all around the world. Select an area to download its weather details as Grib file. You can drag and select a portion on world map to select an area, or type in the longitude and latitude range. The weather info to download can be selected to download under three tabs, which let you download standard weather data, atmospheric data, and ocean data. It downloads and saves Grib data as .grb file. You can also open previously saved Grib files. Weather data for a week is downloaded, which lets you view Grib as animation as well. It also lets you set the map quality and displays rivers, boundaries, and country names if you want. zyGrib is a free multi platform GRIB file viewer, available for Windows, Linux, and MAC OS X. The lite version of Navi Weather is an excellent free Grib file viewer for Windows. It not only lets you view Grib files saved on your computer, but also provides weather forecast Grib files to download and view. It is very easy to download a Grib file here; you just have to press Shift Key and select a region on the World map by dragging the mouse across the area. Press Download key to begin downloading the Grib file, and the progress of download is displayed in the progress bar. If you have a previously downloaded Grib file, it will update itself, if you have selected the Upgrade option on the interface. The weather data that you want to view can be selectively downloaded. You can select the options to download Wind speed, Wind direction, Temperature, Pressure, Clouds, Precipitation, Weather Graph, Multi basemap, etc. 7-day weather forecast data can be downloaded as well, along with high resolution data. Place your cursor anywhere on the map to view Grib data for that particular location. It can display weather data in various unit systems, and the units for different data can be changed easily. Navi weather has AIS (Automatic Identification System) support, which is a tracking system for ships and vessels. It connects to AIS network and provides real time weather data. 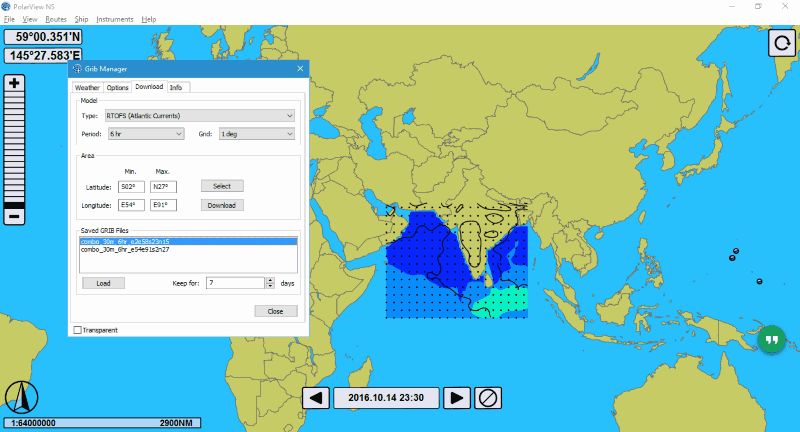 Squid is a free marine weather software, which lets you open and view Grib files. It gives you the liberty to open multiple Grib files and edit Grib layers to add/remove graphic layers. By opening multiple Grib files, you can compare data for the same view. This software has been specially designed for users to track weather conditions, ocean currents, and a lot of meteorological data. All these data can be downloaded or if you have you own set of data as Grib file, you can open them here. High resolution Grib files from various sources, such as: NOAA, CEP, and ECMWF can be obtained on Squid. Getting Grib data for an area is as easy as selecting an area on map, but with right mouse button clicked. Click on “download Grib selection” to get Grib data for the selected area. Temperature, Wind, Cloud, Humidity, Precipitation, Subpoints, and various other weather info are displayed here. You can also download satellite images, along with SYNOP and Buoy data. 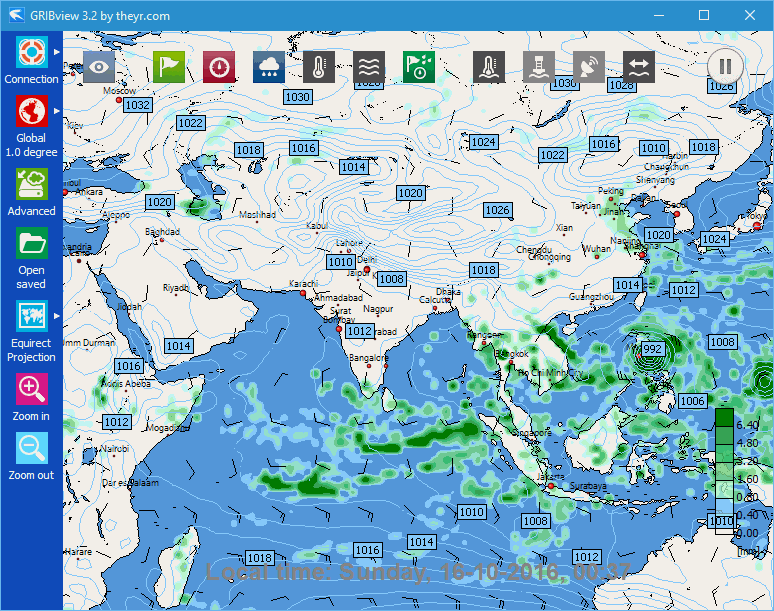 Squid also lets you plot ocean route, based on weather forecast. There’s much more to explore in this Grib viewer and it is going to come in handy if you are a sailor. GRIBview can be used to view high resolution Grib data. It not only lets you open Grib files to view them, but just like other Grib viewers mentioned here, you can download Grib files for a particular location. When you load a file, you will find various action buttons to display Wind, Pressure, Precipitation, Temperature, Sea surface temperature, Buoydata, Tidal stream, etc. While downloading Grib file, you can specify the parameters you want to download, along with the time range for which you want the data. Once you download this Grib viewer and start liking it, you can buy the Pro version which has options for Regional High Resolution and Super Resolution data. PolarView NS is designed as an offshore marine navigation system to help you keep an eye on weather and ocean. You can download and view Grib data on this software to stay updated on most recent weather developments and tidal movements. Here you can view the info on Wind, Rain, Cloud, Pressure, Temperature, Swell, and view satellite images as well. Ocean tides and currents can be viewed here. Grib data is continuously updated from various reliable weather sources, including NOAA. You can selectively download Grib data according to your requirement. 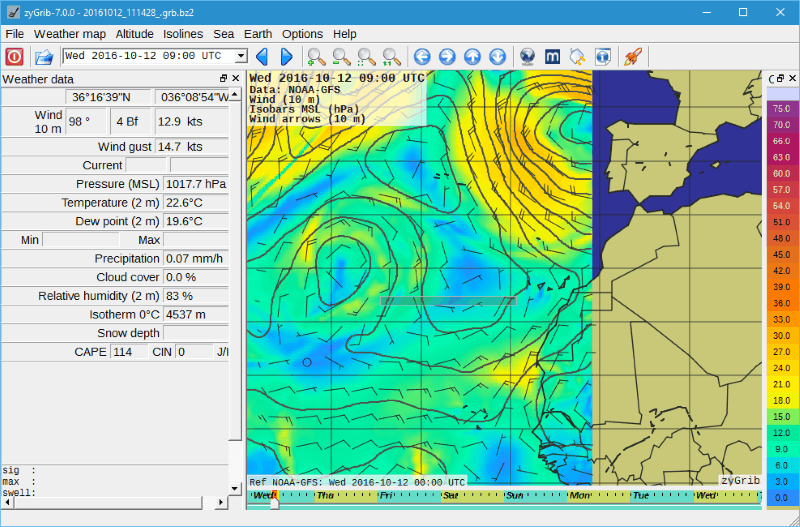 Its another reliable software that one can use to view weather forecast and ocean data to plot an offshore route. 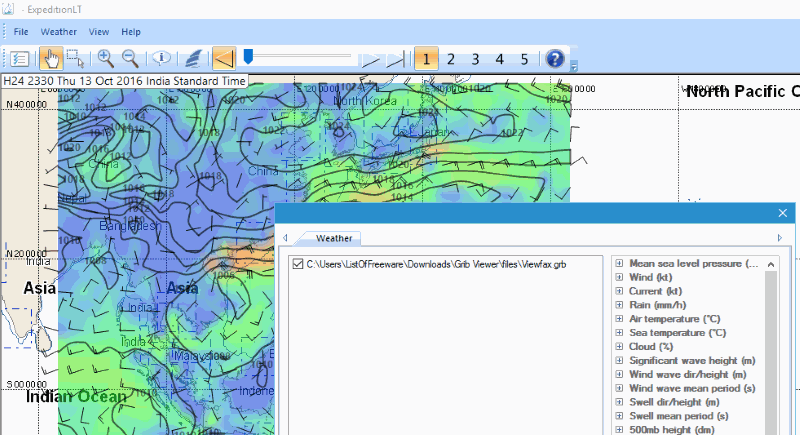 Predictwind Offshore is primarily a wind forecasting software, and can be used to view all sort of weather information. If you have a Grib file that you want to view, or you want to download one and view for an area, this Grib viewer will come in handy. 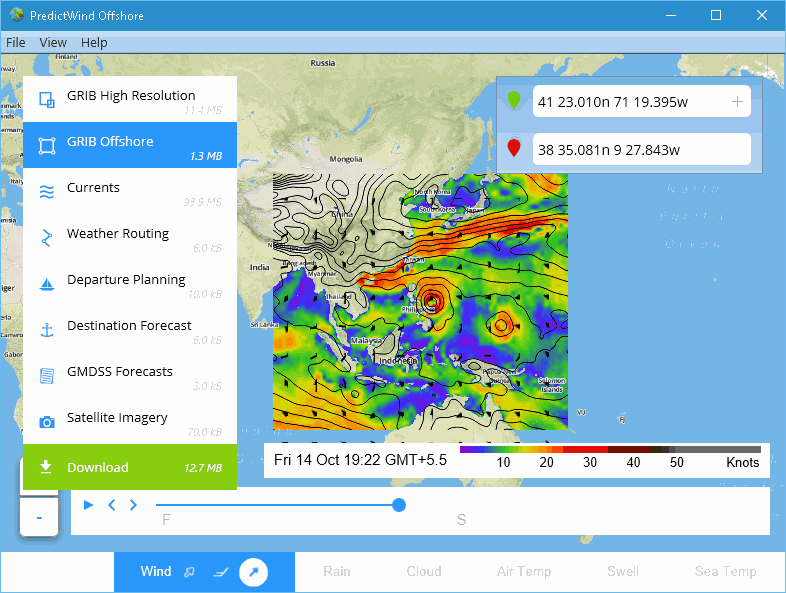 Although it is a paid software, but there is a free version with enough features to download and view Grib files, Predict wind model, View wind map, View satellite imagery, and provide Worldwide coverage. Download grib data for a selected region, and you can choose options to download wind, cloud, rain, temperature, swell, etc. There are many more advanced features available with the paid version of the Grib viewer software. A comparison of free and paid versions is available on the Pricing page of the website. Expedition LT is another free Grib viewer for Windows. It lets you explore Grib files from your computer to open them. You can also download Grib data from this software’s server. To download data, you need to register first on its website. Select a region, then download Grib file selectively. You can choose to download cloud, pressure, rain, temperature, and wind data. When you view Grib file, you can set resolution (100km/60km/8km/1km) and time step (1/3/6/12 hours). Viewfax is a simple and easy to use Grib viewer software. Use it to view existing Grib files or you can request a download directly from the software. It gives you option to view Grib data on Map as BITMAP or view Grib as text without map. 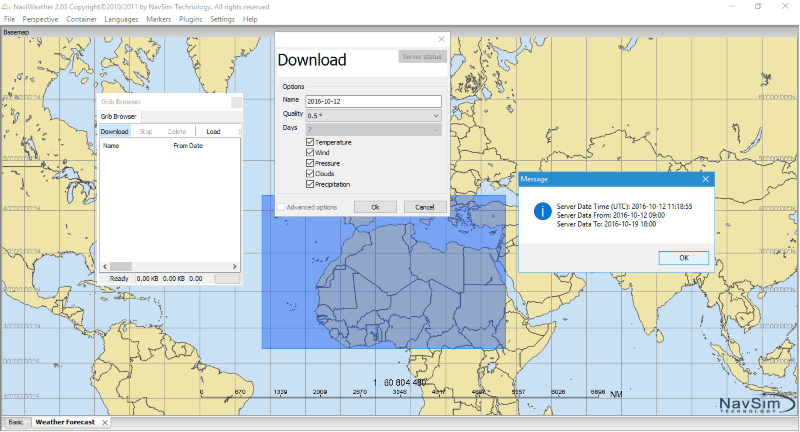 Select an area with mouse or manually enter latitude and longitude range, set forecast time, select the weather info to download (PRMSL, WIND, HGT500, SFCTMP, TMP500, WAVES, and RAIN), and click Send to download the requested Grib info. Viewfax is absolutely free to use for non-commercial purposes, however, you need to buy a license for commercial use.